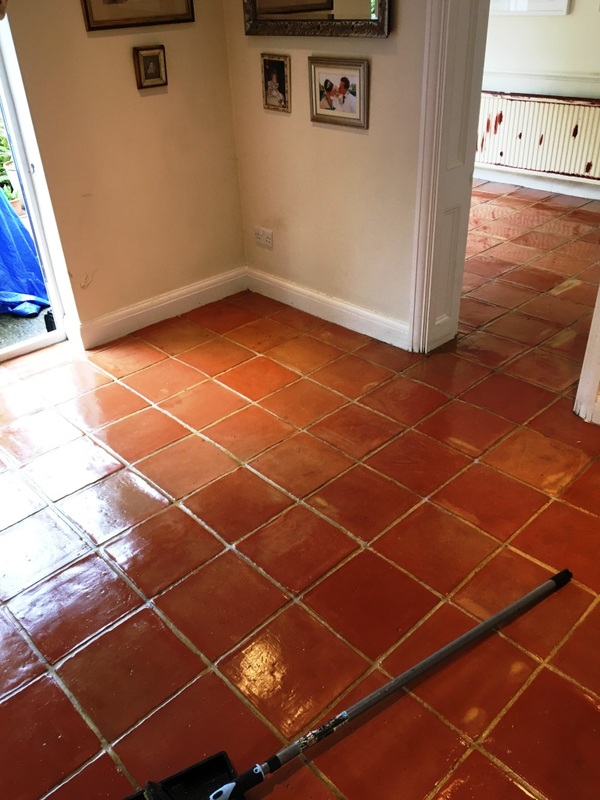 In our experience there is a general lack of good maintenance advice given when new tiled floors are installed which results in floors that looked fantastic following installation losing their appearance of the years that follow. 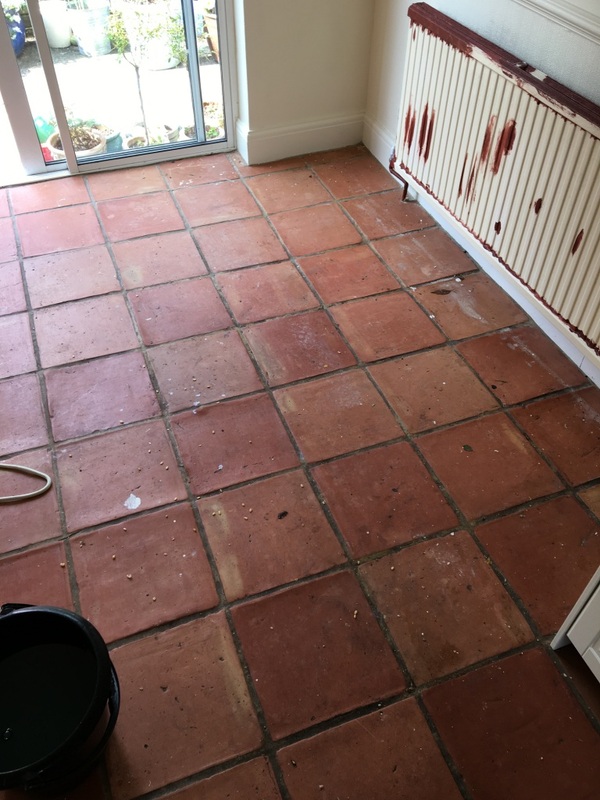 Naturally Tile Doctor aims to fill this gap and this Terracotta tiled floor at a property in Twickenham, Middlesex is a good example. 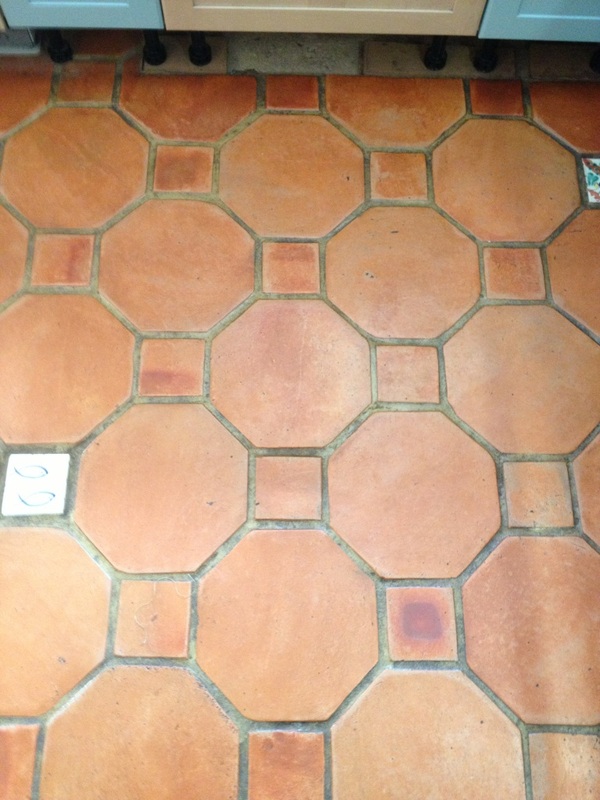 It had not been professionally cleaned since it was installed 18 years prior and due to a multitude of advice over the year’s various oils and sealers had been erroneously applied, leaving a build up of routine maintenance residues in the tile. 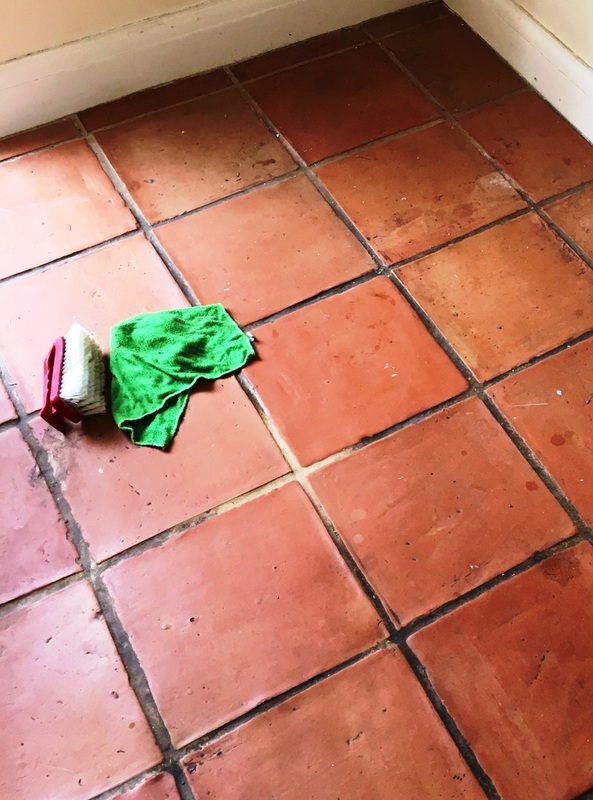 Furthermore, due to its natural porosity, Terracotta tends to allow dirt and stains to become ingrained, making the tiles even more difficult to clean – and keep clean, for that matter. 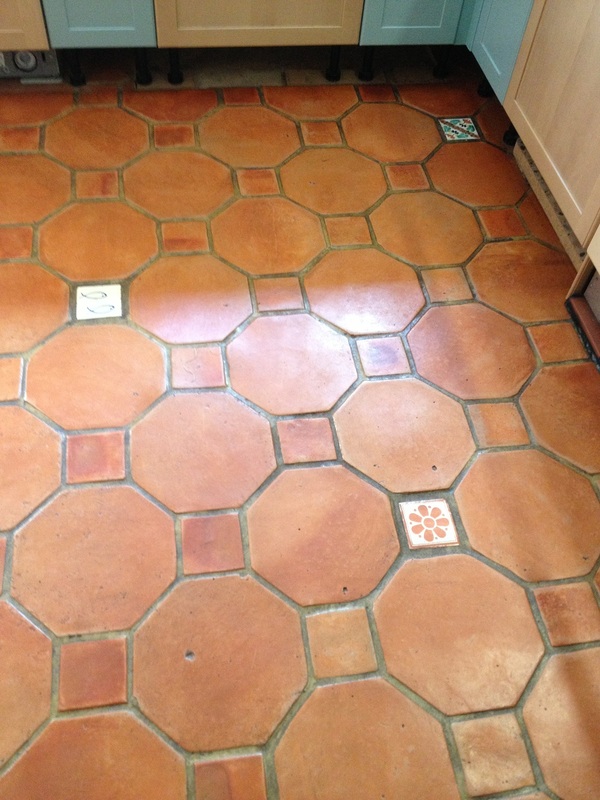 These types of floors need regular maintenance or the only remedy is to strip and deep clean the tiles followed by the application of a fresh seal which is exactly what we had to do in this case. 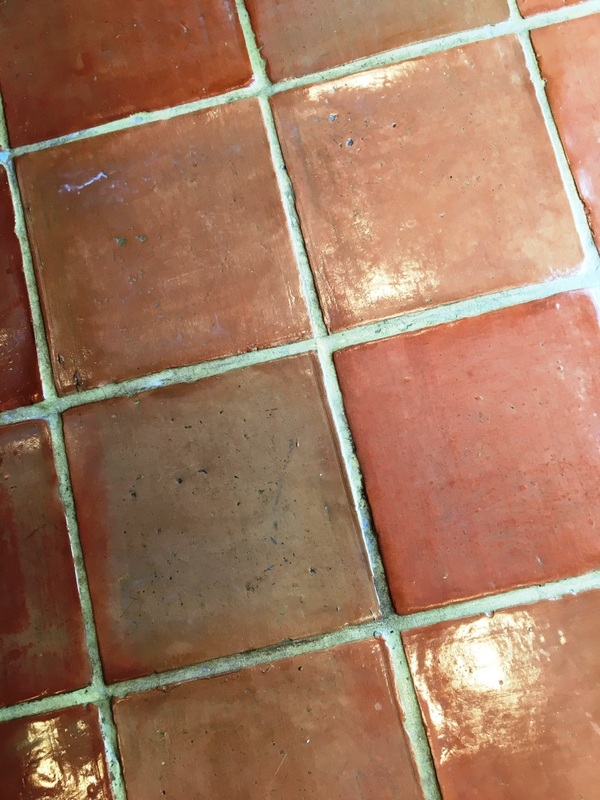 To restore the appearance of this floor I would need to strip off the old coatings; fortunately, we have a strong product just for that purpose so to start with I liberally covered the tiles in our heavy duty coatings remover, Tile Doctor Remove and Go. It helps break down old sealers and oils and I left it to soak in for ten minutes so it could get a good start. I then machine scrubbed the floor with a 17″ scrubbing pad fitted to a rotary machine which takes a lot of the hard work out of the job, although I still need to hand scrub in the corners and along the grout lines with a stiff brush. All of the resulting cleaning chemicals and soiled residue were then flushed and vacuumed away with our pressure rinsing system. 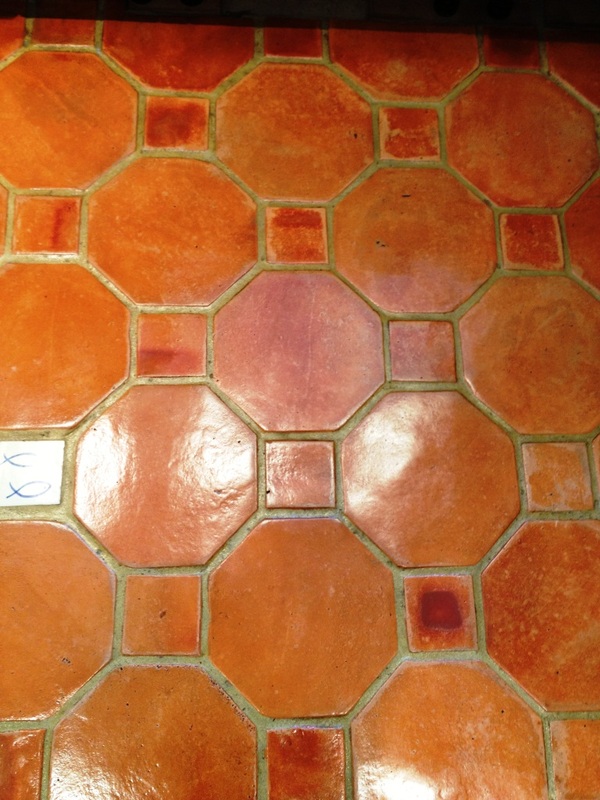 This method leaves the Terracotta tiles completely fresh and clean, ready to receive a new sealer. I left the property overnight, giving the floor a full 24 hours to dry completely. As most who read my posts will already know, a floor with outstanding damp issues cannot be sealed as even the slightest quantity of moisture can cloud the sealer and damage its performance. Upon my return to the property I ran a few damp tests as a matter of precaution. Once satisfied that the floor was completely dry, I proceeded to seal the tiles using seven coats of Tile Doctor Seal and Go, which works really well on Terracotta providing an aesthetically pleasing sheen finish and forms a stain resistant layer on the surface of the tiles to protect them from dirt and stains. I should mention it’s also a water based sealer so there’s no solvent smell given off as it dries which is always a bonus. 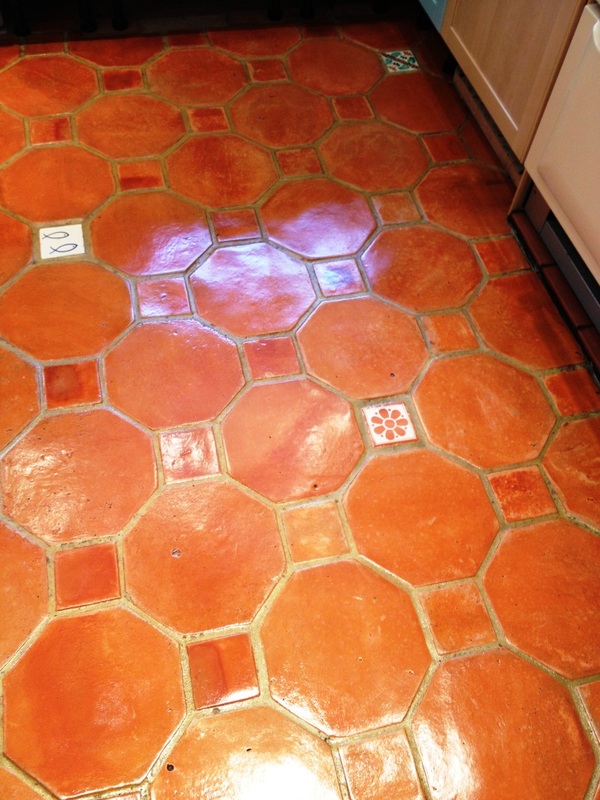 As you can see from the pictures, the restoration has restored the lustre and colour of the Terracotta and the grout looks much cleaner; the very happy customer can be assured that maintaining the condition of the Terracotta will be much easier in the future.